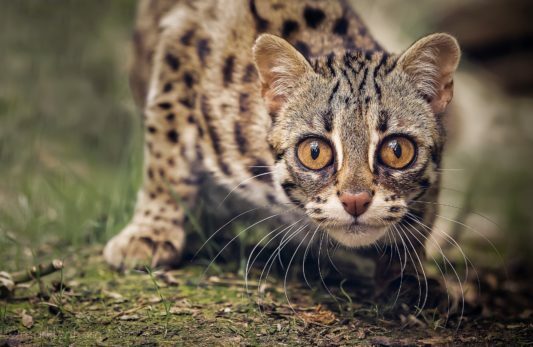 The Asian leopard cat (P. b. bengalensis) is mated with a domestic cat to produce hybrid offspring known as the Bengal cat. This hybrid is usually permitted to be kept as pet without a license. For the typical pet owner, a Bengal cat should be at least four generations (F4) removed from the leopard cat. The "foundation cats" from the first three filial generations of breeding (F1–F3) are usually reserved for breeding purposes or the specialty-pet home environment. Weighing in at 6-15 pounds and reaching lengths of 35-38 inches, this is the most common cat of Southern Asia. It is similar in overall size and shape to the domestic cat, but it has longer legs. Its coat has a great deal of variation in its color throughout its range, and tends to be yellowish-brown in the tropics and grayish-brown in the northern part of its range. The coat is dotted with black spots, which sometimes are solid and sometimes rosettes. The tail is banded with dark rings towards its buff colored tip. The ears are dark with central white spots. Sumatra cats are smaller with fewer markings; Java and Bali cats are duller; Borneo cats are brighter and redder; Pakistan cats are grayer; Manchuria cats are much larger than the other subspecies with much thicker fur, grayer in color and less spotting; Philippines cats are the smallest. Woodlands, forests, and scrub at all altitudes (as long as snow isn’t deeper than 4 inches. India, southern and eastern Asia including Indonesia and the Philippines. The Tshushima, or Amur lives in the Tshushima Islands. In the northern part of its range, breeding occurs once per year usually in February/March. In the tropics, there is not believed to be any set season and mating takes place year round. Gestation is 65-70 days, after which females produce a litter of 2-4 kittens. At birth, the newborns weigh approximately 2.75 ounces, and will gain about 11 grams per day. Their eyes will normally be open by the 10th day. They reach sexual maturity around 18 months. In captivity, they have lived up to 15 years, but tend to lose their teeth at 8-10 years. Primarily nocturnal, they hunt both on the ground and in the trees. The primary diet consists of rodents, young ungulates, hares, birds, reptiles, insects, eels, fish, and occasionally carrion..